I have been waiting for Abby to have her kid(s) now for over a month. In a previous post I predicted that she would have them by the end of august. That time frame came and went with no sign of progress. Let me back up a bit, I have been just plodding along doing chores and working on a cleanup project for the past few weeks. The chickens and ducks have been doing very well at keeping me stocked with eggs, and they are entertaining to watch. 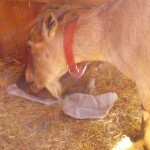 The goats, mostly JuneCarter and Skeeter, have been keeping me supplied with more milk than I can use. I did a quick calculation a couple weeks back and figured out that I milked 86 pounds in a 10 day period. At 8 pounds to the gallon that is roughly just over 1 gallon/day. At the same time the eggs have been piling up. 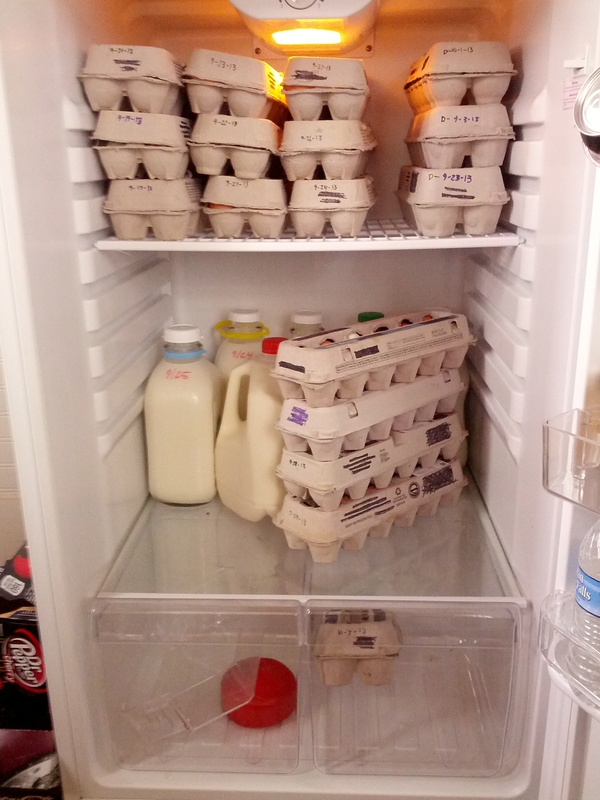 as of this writing I have 12 13 14 dozen chicken eggs and 3 dozen duck eggs. I don’t have a supply problem. I have a demand problem. 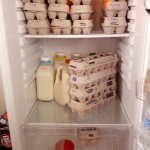 I do have regular customers for the eggs and a few people who take the milk for personal use, like soap making and cheese making and I know that a few of them drink it as I do. However there simply are not enough customers to keep up with the supply. During the past couple of weeks, I had been hearing kittens underneath the floor of the old chicken coop. Sometime during those days I noticed that the mama cat was no longer there and the kittens were getting bolder coming out to greet me when I carried water to the buck pen. Since my wife loves cat, of course we had to buy milk replacer for them and try to rescue the kittens. There were two black and three gray ones in this litter. The Buck pen/shelter has not really been cleaned out since I first brought Buck-O home and so it was time to get to that task. I don’t know how the bucks can trample straw down to a fine dust and yet make it so wet and compacted that it is difficult to pick up with a cleaning fork. And the smell is something that will stay with you for days as it invades your sinuses and clings there like an evil fog. This environment makes an excellent breeding ground for flies and they did not seem to appreciate being disturbed. The only good thing about this time was that there was a strong wind out of the south so I could step out of the shelter and escape the flies and the dust and the smell for a brief period. It did not help either that both Buddy and Oreo(FatHead) thought what I was doing was the most interesting thing in the whole entire universe! I knew that I could not be more than one month off in my prediction of Abby’s due date so on the 30th of Sept. I started seeing the signs I had been expecting a month earlier. Abby had grown an udder earlier, but now she was really “bagging up” and she had the tell tale mucous string that precedes labor. I kept a watchful eye on her as I tried to irrigate the lawn and deal with the dog and chickens and ducks. I even checked on her and the kittens in the middle of the night when the dog had to go out. Everyone was just fine, so far. Oct. 1 when I went out at 8:00 to feed everybody there was a dead kitten just laying there in a weed patch in front of the garage. I hate having to deal with cat carcasses first thing in the morning, but I removed him to the cat burial ground and when I went into the house I told Marky we had lost a kitten. She went out to feed the kittens and discovered a second dead one inside the garage. Both looked as if they had been mauled by something, they were both of the black ones. These little ones had been the boldest of the litter and I guess the saying is “curiosity killed the cat”. Not a good start to the day, but Abby was showing signs of being closer to labor. I had just finished taking care of the second cat, put away the duck and chicken eggs and gotten the milk pail washed when I heard Abby call loud and clear. It was time! I decided that milking could wait and went out to watch incase I was needed. She had a little bit of a problem pushing the Kid’s head out, but once that was cleared the rest of the birth went easily enough. She seemed to give up just before it was complete so I grabbed the kid’s front feet and gently pulled until he was out and wiped off his face. I then held my breath until he took his first one. At this point Abby walked away. She just walked out of the shelter and I had to lead her back to the baby so she could clean him off. She did about half of the job and walked away again. It was like she was not interested in the kid. She had given birth, now someone else could take care of the rest! In the meantime I decided to go ahead and milk the others. I was a bit distracted and starting to get frustrated with Abby. I milked JuneCarter and then tried to quickly finish cleaning off the kid. Milked Dolly and lead Abby back in and tried to make her feed the kid. Gave up and milked Skeeter then went inside to process the milk and find the colostrum replacment. Going back and forth to the newborn kid and the milking was really stupid and I had to toss that batch of milk down the drain. I could not have used it except maybe for chicken feed. I did not think of it at the time. I mixed up a bottle for the kid and went out and fed him. All of this time he had been learning to stand and walk and whenever he approached Abby, she would kick a little and just walk away. Not the best of parenting skill there. I should mention that from the start of her labor, about 8:30 and up to this point, Abby has been crying. A kind of harsh, angry, frustrated “I’m hurting” bleating that really gets annoying very quickly. 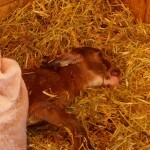 It did not stop even after she had delivered what I thought was the afterbirth. 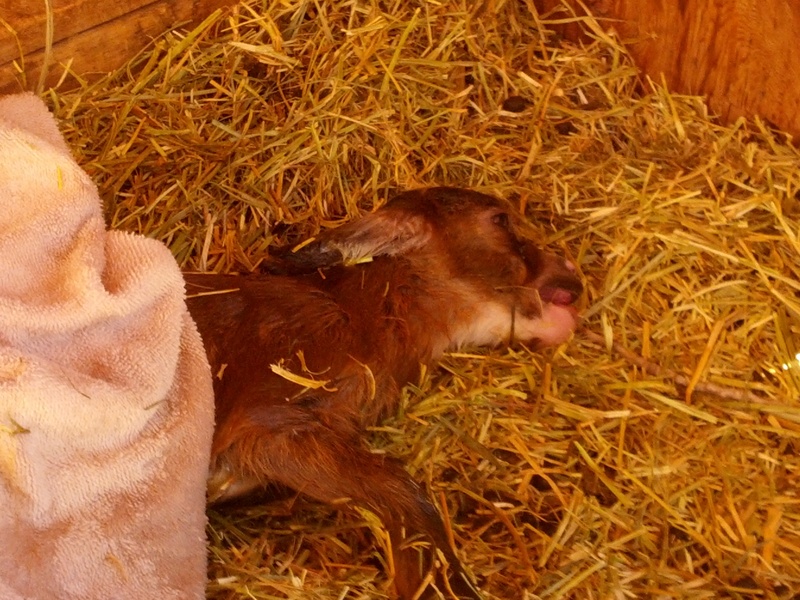 And then about 1:00 she delivered her second kid, still attached umbilically to a really weird looking placenta. The kid came out breech, and stillborn. She would have been a bit smaller, darker colored version of her brother. I wanted to cry. 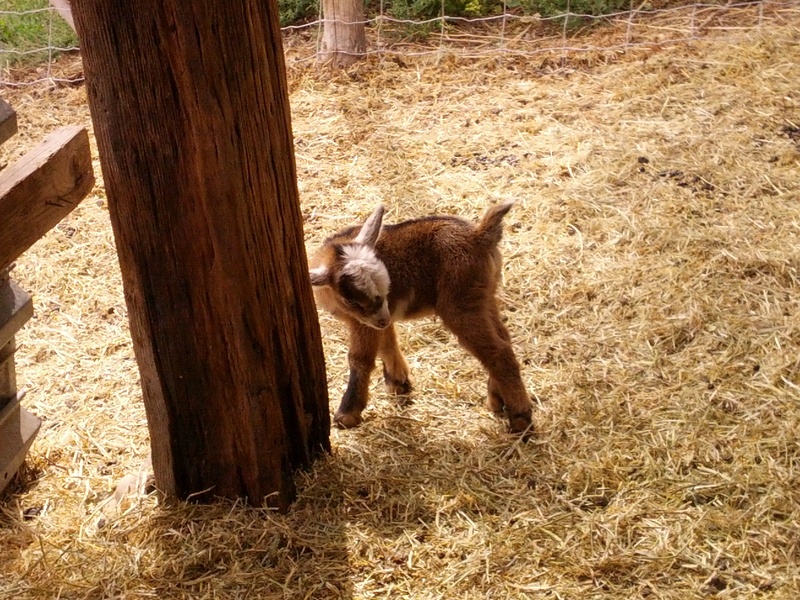 But there were other things to take care of, I had to try to coax Abby to feed her baby, I had to feed the dog and the chickens and a newborn goat. I had to bury the dead for the third time that day. 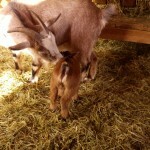 Postpartum depression in goats? Abby seemed to be showing signs of it. She would circle around the spot where the second kid was delivered, paw at the ground, cry, and lay down and cry some more. Every time her baby would approach, she would sidestep him and walk away. He needed her and she needed him even though she did not know it. We finally got Abby in the shelter and up on the milking stand and locked in. 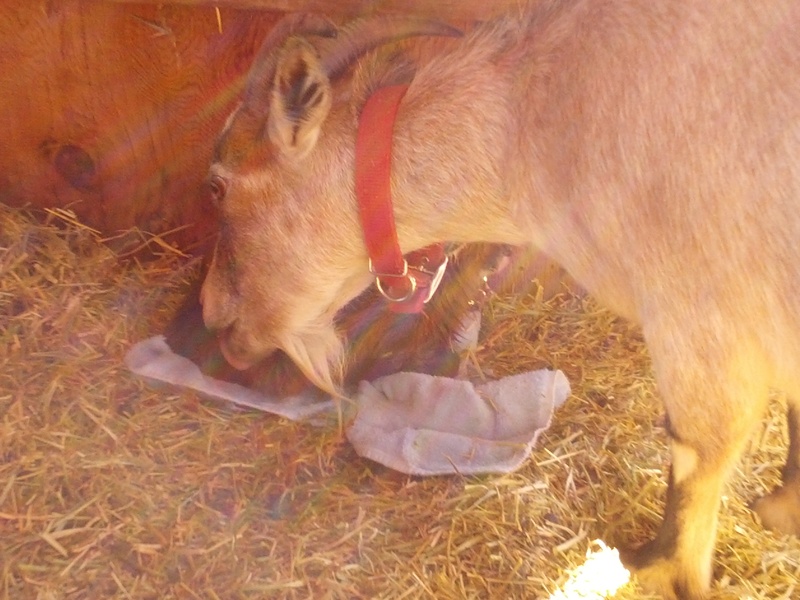 We were then able put Rusty on her udder and he started nursing! Now it was dark though, and the temperature was dropping and Abby was not being a great mama. So we decided to bring him onto the back porch overnight. Marky prepared a cat carrier and we brought him in and put everybody to bed. I got up at 2:00 to check on Rusty and feed him. It took a great deal of effort and some prompting from my wife to wake me up. But we got him fed and back in the carrier. 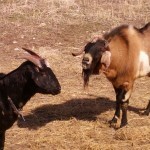 I was up at 6:00 to feed him again, and at that time I took him back out to the goat pen and let him run with his herd. Victory is mine! Yesterday 10/2/2013 I was able to observe Abby acting more maternal to her kid. 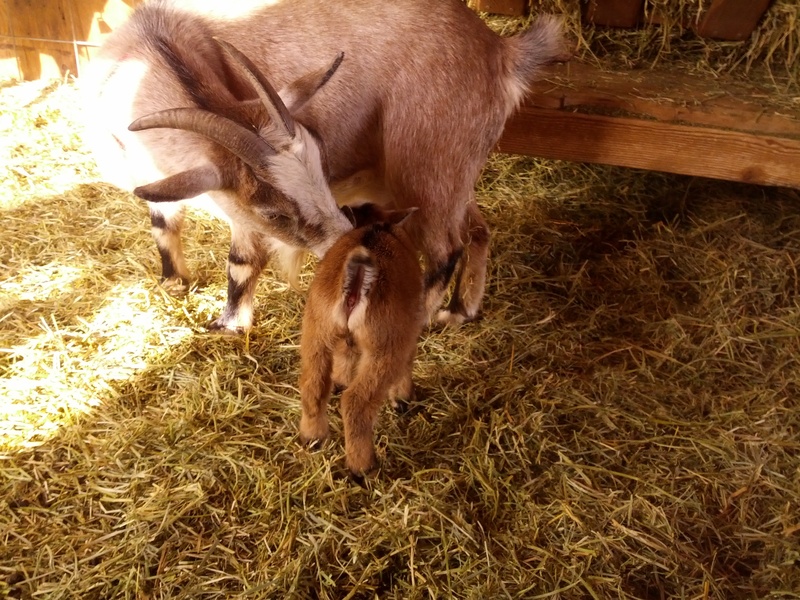 I watched her stand still to let him nurse while I milked the girls in the morning, every time I feel his belly now he feels full, and I have seen evidence that both his and his mama’s digestive tracts are fully functioning. I think that as long as I go in and hold Abby still for a few minutes throughout the day, I won’t have to bottle feed this little one. 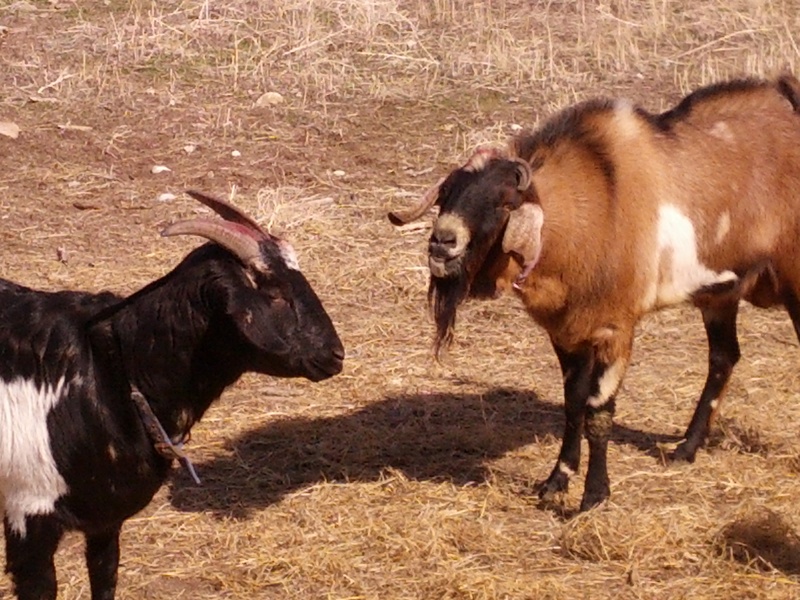 The newest member of the StoneFace Farm herd, Rusty. It turned out to be a good day after all! 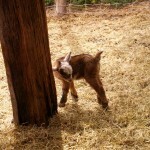 This entry was posted in goats, on the farm. Bookmark the permalink.